original typed recipe of golden cookie recipes! This is the third of four recipes my lovely father-in-law typed up for me. I’ve guarded that sheet of typed recipes as closely as I have guarded my family. Recipes are a very important part of life-it’s a tangible item to grasp on to when you need to lift spirits, or pull together a holiday, or celebrate an important occasion with the ones you love and cherish. Every recipe has an origin, a story, and hopefully a happy outcome. Take this cookie for example. 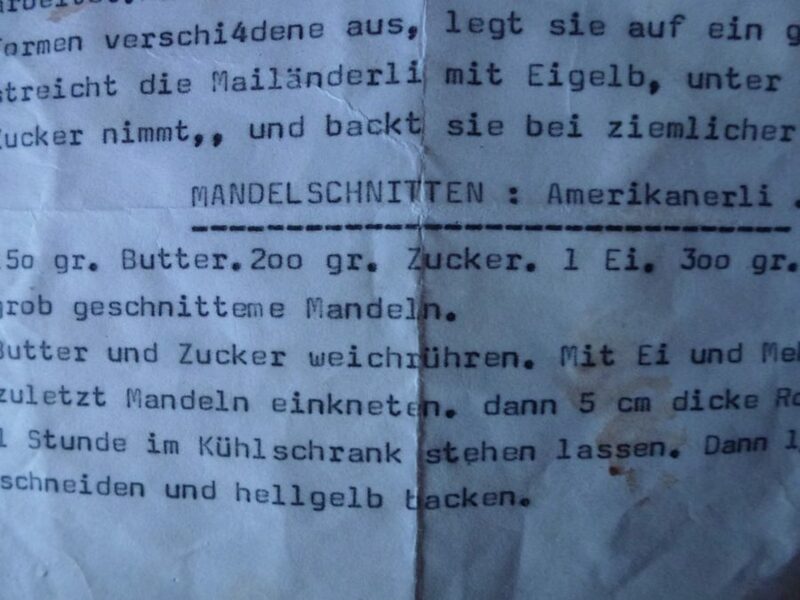 I’m beginning to think that the Mandelschnitte, or as my father-in-law typed it, (Amerikanerli) is an original. I’ve spent a bit of time combing the web to find a reference, but I haven’t succeeded. It might be the name that is original, but I’ll take that too. This is a typical Christmas cookie that is soft to medium texture, buttery with slivered almonds. Like the other three recipes, they are very easy to make. You make this dough ahead of time, roll it in a ‘log’ wrap it up in paper and put it in the fridge, (or outside if it’s cold enough) then slice, bake and finish. 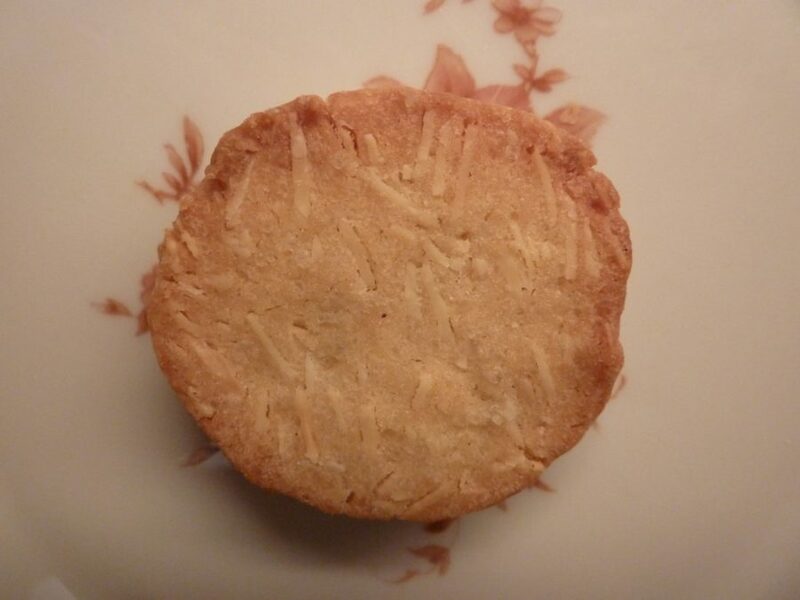 These family cookies date back to the 40’s or earlier as most of the Beerli recipes do. Those were not easy times in Europe, but somehow, the ‘guetzli’ (cookies) were never forgotten. With an electric mixer, combine butter, sugar and egg and mix until whipped and well combined. Now cut slices slightly less then 1/4″ thick and put on a buttered baking sheet or on baking paper. Bake at medium heat until bright yellow. Combine almonds with dough by hand and knead together until well combined and smooth. Preheat oven to 200 Celsius, after the rolls are removed from the refrigerator. Line cookie sheet with baking paper, unwrap your cookie rolls, and begin to slice slightly less then 1/4″ thick. Arrange slices on the baking sheet and bake for about 15 min, or until light golden brown. note: can be stored in Christmas tins, lined with wax paper Enjoy!